Abstract: The determination of the calibration parameters of the gravity gradiometer plays an important role in the GOCE gravity gradient data processing. In this paper, the temporal signals and outliers in the GOCE gravity gradient observations are analyzed. Based on the different global gravity field models, the scale factors and biases are determined in all the components of GOCE gravity gradients. And then the accuracy of the calibration results is validated. The results indicate that the effect of the ocean tide is at mE magnitude in the measurement band, which is equivalent to the precision of the gravity gradiometer. While the effect of the non-tide temporal signals is, with the terrestrial water is in the order of 10-4E slightly less than that of the ocean tide. The outliers in all the gravity gradient components are larger than 0.2%. After the calibration using global gravity field models except EGM96, the stability of scale factors in the Vxx, Vyy, Vzz, Vyz components reaches 10-4 magnitude. And the Vxz component reaches 10-5 while that of the Vxy component is about 10-2, which are in accordance with the accuracy differences of the gradient components. 罗志才, 吴云龙, 钟波, 等. GOCE卫星重力梯度测量数据的预处理[J]. 武汉大学学报(信息科学版), 2009, 34(10): 1163–1167. LUO Zhicai, WU Yunlong, ZHONG Bo, et al. 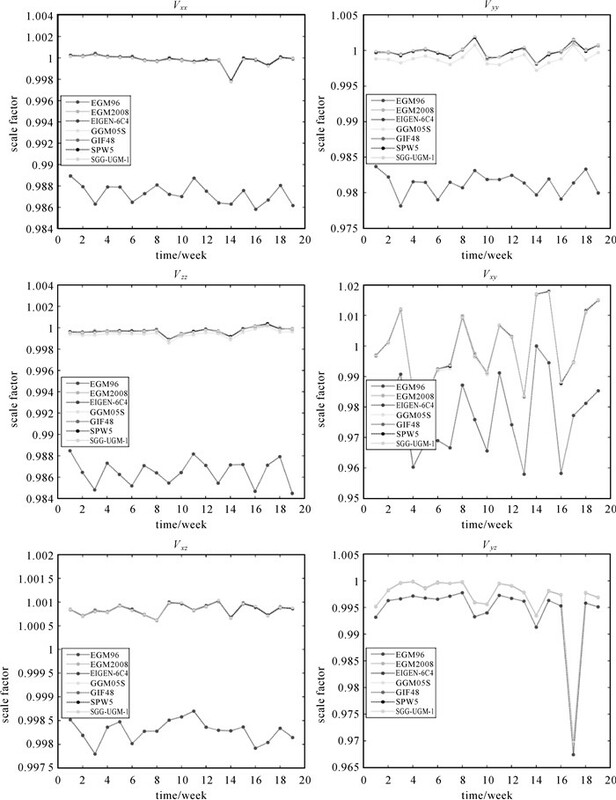 Pre-processing of the GOCE satellite gravity gradiometry data[J]. Geomatics and Information Science of Wuhan University, 2009, 34(10): 1163–1167. 苏勇, 范东明, 游为. 利用GOCE卫星数据确定全球重力场模型[J]. 物理学报, 2014, 63(9): 099101. SU Yong, FAN Dongming, YOU Wei. Gravity field model calculated by using the GOCE data[J]. Acta Physica Sinica, 2014, 63(9): 099101. ZHU Guangbin. Research on the theory and methodology for the Earth's gravity field determination using satellite gravity gradiometry measurement[D]. Wuhan: Wuhan University, 2010. BOUMAN J, KOOP R, TSCHERNING C C, et al. Calibration of GOCE SGG data using high-low SST, terrestrial gravity data and global gravity field models[J]. Journal of Geodesy, 2004, 78(1-2): 124–137. PAIL R. Local gravity field continuation for the purpose of in-orbit calibration of GOCE SGG observations[J]. Advances in Geosciences, 2013, 1: 11–18. BOUMAN J, FIOROT S, FUCHS M, et al. GOCE level 2 gravity gradients[C]//Proceedings of the 4th International Goce User Workshop. Munchen, Germany: ESA, 2011: 1-4. RISPENS S M, BOUMAN J. 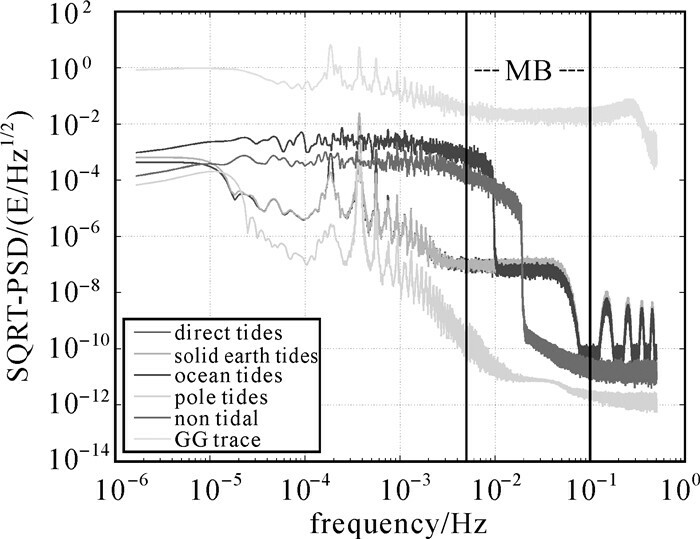 External calibration of GOCE accelerations to improve derived gravitational gradients[J]. Journal of Geodetic Science, 2011, 1(2): 114–126. 徐天河, 杨元喜. 利用现有重力场模型求定CHAMP卫星加速度计修正参数[J]. 测绘学报, 2004, 33(3): 200–204. 徐新禹, 赵永奇, 魏辉, 等. 利用先验重力场模型对GOCE卫星重力梯度观测值进行校准分析[J]. 测绘学报, 2015, 44(11): 1196–1201. WU Yunlong. Study on pre-processing of GOCE satellite gravity gradiometry data[D]. Wuhan: Wuhan University, 2010. 苏勇, 范东明, 黄强. GOCE梯度数据坐标系转换及误差分析[J]. 大地测量与地球动力学, 2014, 34(3): 151–154. SU Yong, FAN Dongming, HUANG Qiang. 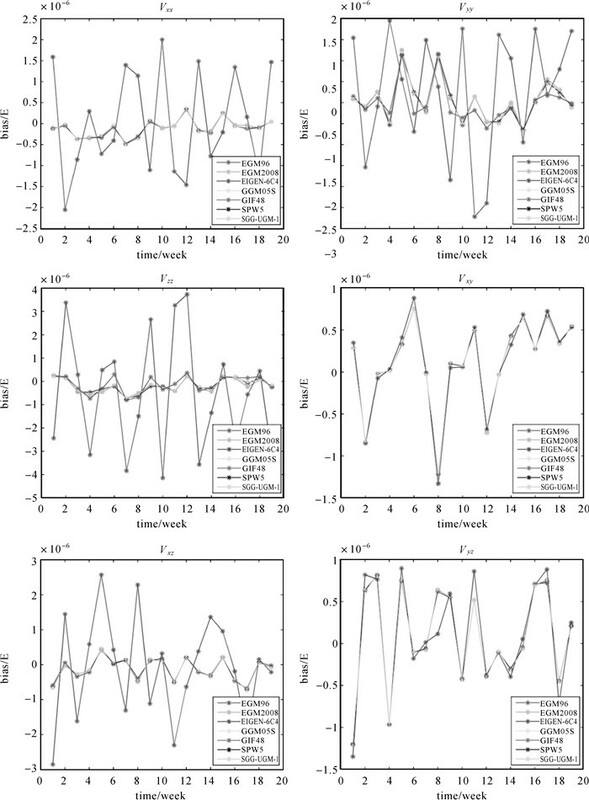 Coordinate system conversion of GOCE gradients data and error analysis[J]. Journal of Geodesy and Geodynamics, 2014, 34(3): 151–154. 邓文彬, 许闯, 阿力甫·努尔买买提. 卫星重力梯度观测数据的时变信号影响分析[J]. 武汉大学学报(信息科学版), 2016, 41(1): 72–78. DENG Wenbin, XU Chuang, ALLFU·NURMMAMAT. 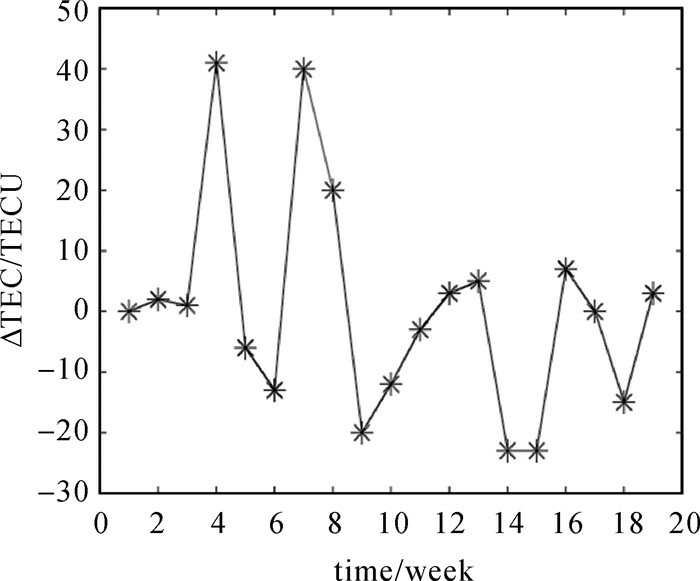 Effect of time-varying gravity signal on satellite gravity gradient observations[J]. Geomatics and Information Science of Wuhan University, 2016, 41(1): 72–78. 罗志才, 周波阳, 钟波, 等. 卫星重力梯度测量数据的粗差探测[J]. 武汉大学学报(信息科学版), 2012, 37(12): 1392–1396. LUO Zhicai, ZHOU Boyang, ZHONG Bo, et al. Outlier detection of satellite gravity gradiometry data[J]. Geomatics and Information Science of Wuhan University, 2012, 37(12): 1392–1396. LEMOINE F G, KENYON S C, FACTOR J K, et al. The development of the joint NASA GSFC and the National Imagery and Mapping Agency (nima) geopotential model EGM96[R]. Greenbelt, MD: NASA Goddard Space Flight Center, 1998: 103-115. PAVLIS N K, HOLMES S A, KENYON S C, et al. The development and evaluation of the earth gravitational model 2008(EGM2008)[J]. Journal of Geophysical Research, 2012, 117(B4): B04406. RIES J C, BETTADPUR S, POOLE S, et al. Mean background gravity fields for grace processing[C]//Proceedings of GRACE Science Team Meeting. Austin, TX: [s.n. ], 2011. TAPLEY B D, FLECHTNER F, BETTADPUR S V, et al. The status and future prospect for GRACE after the first decade[C]//Proceedings of AGU Fall Meeting.[S.l. ]: AGU, 2013. FÖRSTE C, BRUINSMA S L, ABRIKOSOV O, et al. EIGEN-6C4: The latest combined global gravity field model including GOCE data up to degree and order 2190 of GFZ potsdam and GRGS toulouse[R]. Berlin: GFZ, 2014. GATTIA, REGUZZONI M. GOCE gravity field model by means of the space-wise approach (release r5)[R]. Berlin: GFZ, 2017. 梁伟, 徐新禹, 李建成, 等. 联合EGM2008模型重力异常和GOCE观测数据构建超高阶地球重力场模型SGG-UGM-1[J]. 测绘学报, 2018, 47(4): 425–434.